Hi! This is going to be quick because I have Trader Joe's frozen tacos in the toaster and have to eat them as soon as they are done. Puff has been helping me plant all my springtime stuff, I've got pots in half of the windowsills in the house hoping some seeds sprout, then hold up when we move to our new house. I'm excited, we're recruiting friends to help with the move (interested? email me!) and generally getting ready. It's not for another few weeks, though. Still, it's a BIG relief to have found a place, put down the deposit, and not have to worry about it. It's my favorite time of year now. Spring is coming, and despite our mild winter, I'm ready. I want to wear skirts and sweatshirts, and not have to bundle up. I am ready for plants, and gardening, and fresh produce. ALSO, it's St Patrick's time! I am not Irish nor do I really care about St Patty's day, except that it means it's 17 days until my birthday (and 14 to Alex's) and corned beef is everywhere!!!!!!! I love corned beef. When I was a kid, it was what I wanted for my birthday. I've been known to buy a whole (small) brisket and eat most of it myself. I could eat corned beef everyday. I hardly have leftovers but when I do there's nothing better than corned beef hash and fried eggs. Mmmmm. If you're making corned beef, the boiling way (which I much prefer over the baked way), then add 1 head of cabbage, roughly chopped, and a few potatoes, say 4, peeled and cut into about 6 pieces in the last twenty minutes of cooking. Remove the meat when it's done, separate out the potatoes and mash them with a lot of butter (I used about a half a stick, don't tell my mom) and about a half cup of milk/cream/half and half, and a good big pinch of salt and pepper. Stir in the cabbage, but first chop it up finer if you want. I wanted to because I wanted to pretend I wasn't eating cabbage. It should be good and fluffy. If you're not making corned beef, boil a pot of salted water and add your potatoes and cabbage. I threw in half a rough chopped onion too. Cover and boil until everything is tender, about 15 minutes. Follow instructions above. This is one of Alex's favorite soups. He wants me to make it all the time, I don't really feel like it becuase it's not my favorite, but then I make it and am reminded of how good it really is. Rinse the split peas well. 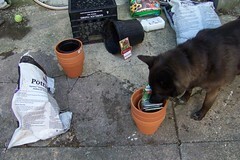 Put everything in a pot, cover with water. I used a fairly small pot, if you want to get fancy you can throw in a boullion cube, or use stock, but you really don't need to. My pot held about 6 cups of water, but I've made this with up to about 10 cups. It depends on how thick you want it. Bring to a simmer, skimming off any gross stuff that comes to the top, then turn down heat to low and cover, and let simmer about 1 1/2 hours, stirring occasionally. Remove bones from the soup, pick the meat off and set aside. If you want the soup totally smooth, you could puree it now. I usually don't. If you don't, add back in the pieces of meat, remove the bay leaves, and heat through.Taste for seasonings. Serve with croutons, possibly with a dash of cream if you want. Jill, Oh, yeah, don't tell your mom about all that butter! Love, Mom p.s. Mark my words! One day you'll regret all that fat. Eat vegetables! I tasted colcannon for the first time about a month ago and I've been to Ireland twice, also celerated St Pat's day numerous times!!! 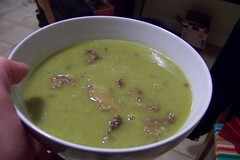 The soup looks pretty good too!